It’s been lengthy since the election campaign as the Nuer students in Kenya were yawning to elect novel leadership. This organization is no longer Nuer Students’ Union as before. This organization formerly known as Nuer Students’ Union in Kenya(NSUK) has been officially changed to Naath Students Union in Kenya (NSUK).Therefore, the organization is non-political as stated in its constitution. It’s constitutional that terms limit in office does not exceed one year. As usual, the 2016-2017 leadership finally comes to an end in march-2017. The campaign was officially unveiled and open as per the constitution of Naath students’ union in Kenya (NSUK). However, despite the fact that campaign was open in January 2017 by the electoral commission; some challenges were encountered by the election body. It was then extended up to February before the official closure of campaign this month. It was on 25th February-2017 when the Nuer electorates cast their votes and finally elected leaders of their choice. The electoral commission then gave two weeks period of final swearing of newly elected leadership. It was on Saturday 11th march-2017 when the peaceful transition of power was witnessed by naath students in Kenya. The colorful inauguration characterized by jubilation was conducted at pal’s restaurant opposite Ken com house in Nairobi city center. 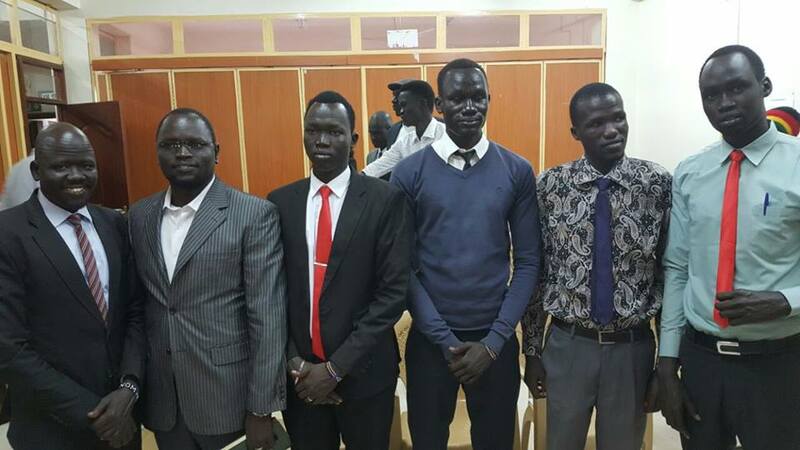 The newly elected leaders of Naath students’ union in Kenya were from four (4) states of Nuer origin. These states include Bieh state, Phow state, Latjor state and Liech state respectively. However, these newly elected leaders were from different universities specifically Nairobi the Kenyan capital. The constitution allows only the executive positions to be contested for and the other posts to be nominated by the elected chairman based on the constitution. The followings are the elected leaders that were recently inaugurated comprising of the executive board only. This is the first ever peaceful transition of power witnessed by naath students from different walks of life. The electoral commission has done a tremendous work to make the inauguration more successful. The naath students were more excited than you can imagine before entering the inauguration hall. One could tell that the newly elected leadership and most importantly the chairman is a Godly chosen leader. I think this election process will provide framework and will act as an example in the future election processes. Naath community in Kenya for the first time in the history made us proud than ever before. Amongst the invited quest of honor was the Bishop Thomas Gamy who sworn in the recently elected leadership. After the oath, the election commission then allows the new leadership to execute their duties publicly without fear or favour. The chairman in his remarks vows to unite all students and works together for the betterment of naath students in Kenya. “Challenges are there but with the students’ cooperation and with God guidance success in his leadership is inevitable”, Bum Assured. He focuses on serving the interest of naath students as well as resuscitating the unity of naath students in Kenya. This entity is independence body ready to mobilize funds from individuals, well-wishers and political parties. Resource mobilization, reducing university dropout rate and accountability are our main concerned and interest in the NSUK leadership. And I quote from Donald Trump speech “time for empty talk is over and it’s time for actions”. We finally had a new leadership and we must works together with the other south Sudanese students ‘association in Kenya for the interest of our students and transformation of our country. We shall respect constitution and works very closely with all stakeholders because together we can do more.